MPI’s Round Spout Drawer Magnets (RSDM series) remove small to medium sized ferrous tramp metal contaminants from dry, granular, free- flowing product streams in round gravity-fed vertical chutes and spouts. Product stream flows through one or two tiers (model dependent) of 1” diameter magnetic tubes designed to create an extremely effective magnetic circuit. 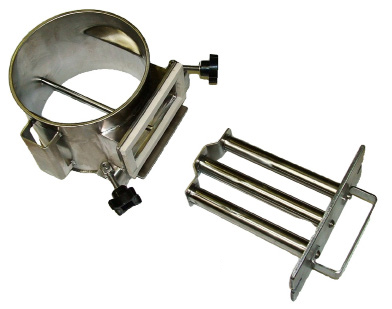 The two-row units have magnetic tubes staggered to prevent bridging of choking of the product stream and maximize magnetic filtration as product flows through the housing. Tramp metal contaminants move to the underside of the magnetic tubes, eliminating tramp metal “wash off.” The front door panel with magnetic tubes attached can be quickly unlatched, removed and cleaned outside the product-flow area.